Approximately 10 thousand members of the Landless Rural Workers Movement (MWT) are participating in a protest march from Goiania to Brasilia in Brazil. The 105 mile march is due to arrive in the capital of Brasilia on May 17. The workers are demanding increased funding for agrarian reform from President Luiz Inacio Lula da Silva. Protesters will target the U.S. embassy, Brazil’s central bank and finance ministry on Tuesday in a call for “social revolution” against Lula’s market-driven economic policies and “U.S. imperialism”, leaders said. 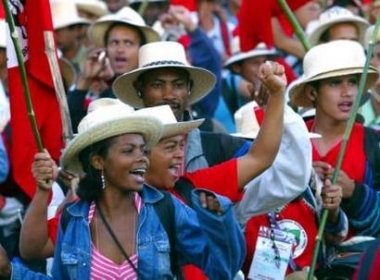 The MST is among the populist Latin American movements backing Venezuelan President Hugo Chavez’s alternative trade plans that counter the U.S.-sponsored Free Trade Area of the Americas. Protest leaders are calling on unions, students and political parties to join the demonstration, which is expected to be the biggest ever outside the U.S. Embassy. The embassy said it would increase security on Tuesday. 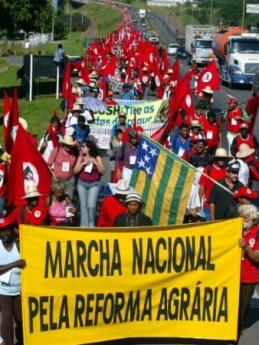 The March started at a rally in Goiania on March 2nd. 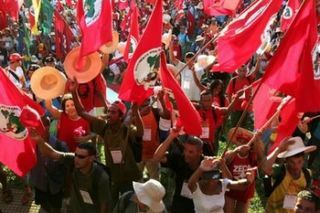 The last time the MST tried to gather Brazil’s left-wing movements was in a 1997 demonstration that drew an estimated 100,000 people. It is unlikely to get that number again. Back then, Lula’s Workers Party was the MST’s biggest political backer. 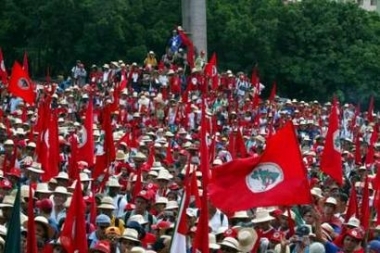 The party subsequently shifted to the political centre to help Lula win the presidency in 2002. Lula promised to settle 430,000 landless peasant families by 2006 to combat Brazil’s chronic land inequality in which one percent of the population controls 45 percent of farmland. As few as 160,000 families will have plots by the end of this year, according to the land reform agency.